My client for this session was Garry, a friendly chap and very experienced all round angler, who’d found himself working nearby for a couple of days and decided to contact me at relatively short notice. It was his hope that I could place him onto his first ever ‘night time bass’. A quick look at the tide times and height revealed a building tide of 4.6m (Salcombe scale) peaking at around 0313 – perfect if you like early morning finishes! I suggested a 2330 meet in order to make the absolute most of the flooding tide over the very shallow rocky ground I’d earmarked. At this point I have to say ‘huge respect’ to Garry for not even wincing at the prospect of being out all night, considering he’d be working during the days ether side of the session. Garry had mentioned that he had a few ‘bits and bobs’ in relation to lure fishing therefore, I brought along the full compliment of my ‘client kit’. But when he opened his van it was like an Aladdin’s Cave in there! A Century 9′ lure rod, a 7′ 6″ 7-28g HTO Nebula, a wonderfully smooth Daiwa Luvias and a very inclusive lure selection – he’d done his homework that’s for sure. The only items he didn’t have (which I’m sure he has now purchased) where my night time ‘staple lures’ such as the Albie Snax, some white senkos and Needlefish. Alongside confirming that what he’d bought would most certainly work, across the full spectrum of water depths and sea conditions, I offered him some advice as to what else he might need, in addition to tying on a fresh new leader knot before we set off down the coastal path on this exceptionally still night. Because we were fishing so early in the new tide, I decided upon a mark that would see him stood on a flat rock (the ledge) and casting into what would initially be 2-3ft of water. This would be the first time I’ve placed a client onto such a mark (rocks) however, this one essentially forms part of a ‘lagoon’ surrounded by outer rocks and is therefore extremely sheltered from the elements – not that we had to worry about that on the night, as the water was about as calm and clear as it gets. Before a client makes their first cast, if they are unsure then I will always demonstrate how the lure should be worked/retrieved (well away from the hot spot) and how the lure looks in the water – in this case, it was yet again, the brilliant Albie Snax. The first cast is so, so important when bass lure fishing and sure enough, following a nice smooth cast, a quick pull on the braid to bed it into the spool and a nice steady retrieve at one full turnoff the handle per second the rod very briefly thumped over… But the fish didn’t ‘stick’ unfortunately. That first ‘hit’ gave Garry almost instant confidence that what he was doing would work – something that is even more important when you’re rooted to one spot continually casting into the gloom. This spot is adjacent to a very powerful tide race, and I think the bass (shoals and bigger loners) move in for a ‘mooch about’ before moving back out into the tide. It has been very reliable in the past, but following that initial excitement it remained too quiet for my liking therefore, I decided on a move a further 500m along the shoreline to fish a nearby shingle cove. Once on the mark, I presented Garry with a photograph of the area at low tide so that he understood the methodology behind my decisions. First cast (still with the Snax attached) and BANG… no hook up… Within the next 10 casts he received at least 6 or 7 ‘hits’ and I was just beginning to consider a change of lure (to a small diving minnow) in order to actually catch one the culprits when, no more than 5m out, the rod whacked over and remained there! Hooray!! At just under 2lb, this rather plump bass (within minutes of moving to a new mark) was very welcome. Garry enjoyed the battle on his ‘peach of a rod’ and gently brought the bass ashore under my ‘full-beam’ (as we weren’t sure at first whether it was a bigger one). It didn’t matter one bit to my client how big it was though – as by this stage he was grinning even more than he already was just from the experiencing of being out there on such a beautiful night. ‘Chuffed to bits’ as they say! I was so happy for Garry as he’d already trapesed quite a distance and put in a lot of effort to catch this one around two and a half hours into the session. We’d enjoyed the moment and had been shining our lights onto the area in front of us therefore, following a few more casts, just to see if there were still bass in front of us, (they weren’t) I asked my client to trudge a further 100m down the shingle to target another ‘zone’ that can sometimes through up some much larger bass – the biggest being 8lb to a client last July here. Yet again, first cast ‘BANG’… no hook up! At least they were in attendance I thought. The bites here were becoming slightly more tentative and more sporadic therefore, I asked Garry to ‘speed up’ the retrieve a touch just to see if we could induce a more positive attack. I heard the lure splash a good 30m out (that is how calm it was) into the darkness and Garry commenced the slightly quicker retrieve… WALLOP! He was in, with this one taking 2-3m of line from the drag – “This is better” said Garry. My head torch went on and a good 25m out the bass was seen crashing around and shaking it’s head. 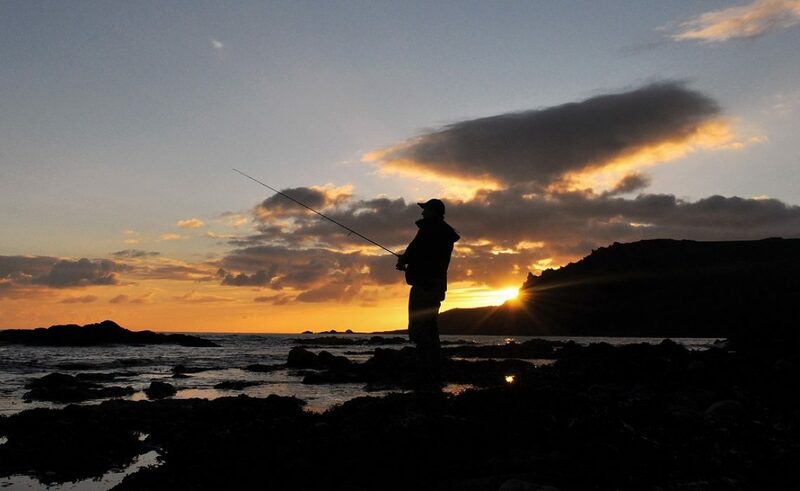 My client again, enjoyed the scrap before doing exactly as briefed – walking backwards up the shingle in those final seconds as the fish neared the beach, so that I could grab the leader and gently slide it ashore. A beauty! At 55cm this one positively ‘nailed’ the Albie Snax following a faster retrieve rate. I don’t think Garry could quite believe what was happening to him by this stage! He’d caught a lot of bass on bait in his time, and a 6 pounder from his local Sussex shoreline on a big surface lure (a Patchinko II), but he’d never been night lure fishing for bass before this session – “I’m loving this” was his phrase of the session! 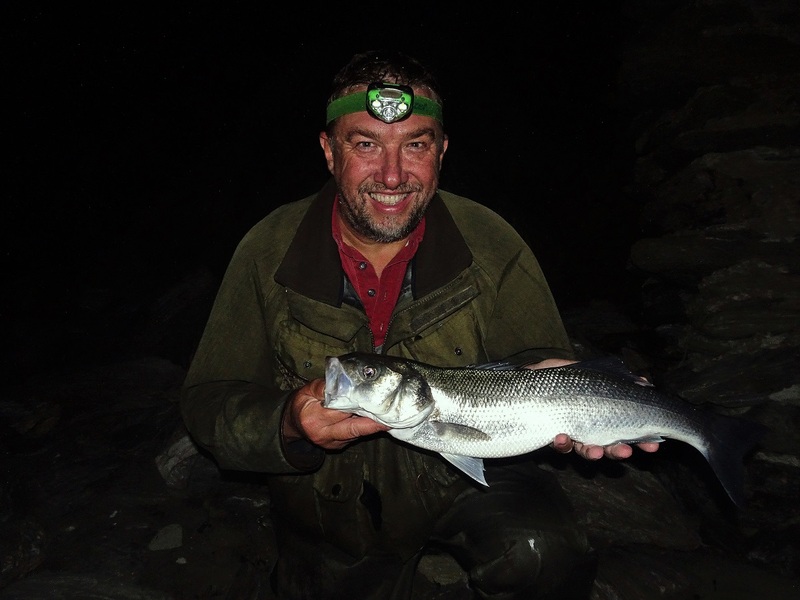 A slender bass that measured 55cm (weighing around 3.5lb) caught from a shingle beach – very comfortable fishing indeed. Used to holding fish, Garry did a fine job of returning his prize. Thereafter, a few handshakes and laughs ensued before, he continued to fish on – “Let’s get a bigger one!” I said. As the tide neared its peak, I asked my client to commence more of a ‘cast and move’ approach as the tide slackened off. This can sometimes catch you those bass that are just sat holding and waiting for the tide to speed up again. About 20 minutes later, another good take resulted in a much smaller one before we decided call it a night. Apart from a very brief spell on the first mark when I’d attached a needlefish to Garry’s clip (that ended badly for the lure!) the Albie Snax had been deployed for the entire session as I have the utmost confidence in them – perseverance (and a change of approach) most certainly paying off during this session. Knowing when to change to an alternative is also key of course and something I’ll no doubt cover in later blog posts. The long walk back up to our respective cars was a full of laughs and stories of bass catches – we were both totally ‘cream crackered’ by this stage but it had all been worth it. It had been a fantastically enjoyable session, with great company and in wonderful conditions. I think Garry was very pleased he’d made the decision to mix business with pleasure – even though he was extremely tired driving all the way back up to Sussex (following a meeting in the morning) later that day. I look forward to your next visit to South Devon mate.